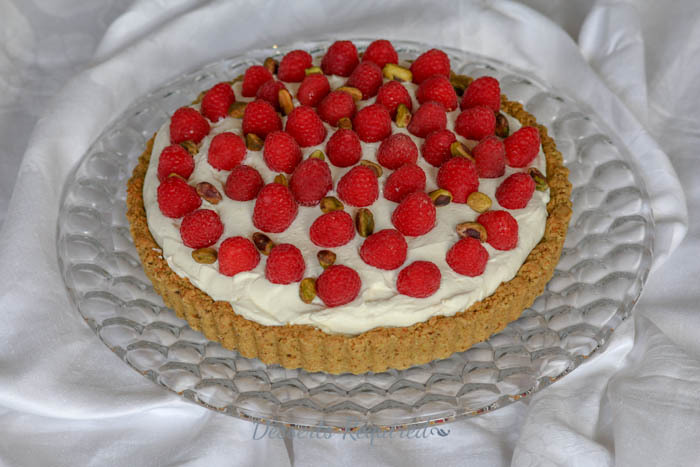 Raspberry Citrus Pistachio Tart is a dessert worthy of being served in a topnotch restaurant. That’s what I had in mind, as I created it. Rosen Shingle Creek, located in Orlando, has several topnotch restaurants on its property. And in addition to being the home for the Food and Wine Conference, Rosen Shingle Creek is also sponsoring a recipe contest for the conference. 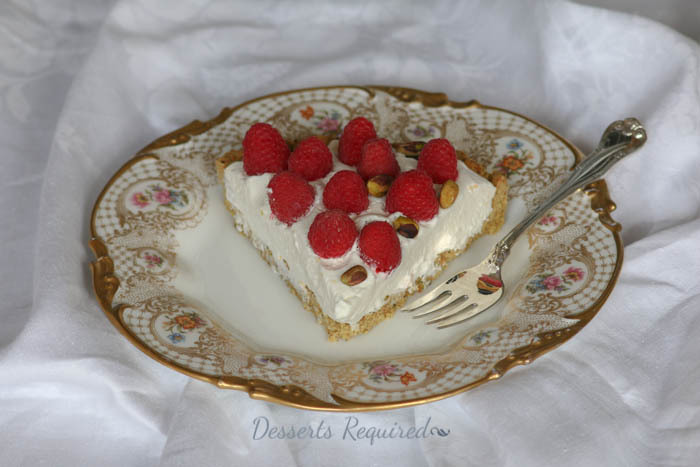 I knew right away that I wanted to incorporate our gorgeous Florida raspberries into my dessert. The big question was, “What else?” I can still remember growing up in Ohio and watching Anita Bryant pitching orange juice on the television. She was always saying that Florida orange juice was the best because oranges from Florida were the best. Now that I have lived in Florida for over 30 years, I can very honestly say that she was right. Which, of course, meant that oranges would be incorporated into my dessert, as well. Raspberry Citrus Pistachio Tart was still not completely formed in my mind until I saw a container of shelled, roasted and salted pistachio shells. Then I knew exactly what I had to do to create a show-stopping dessert; I had to make it creative while still paying homage to the state I love, Florida. 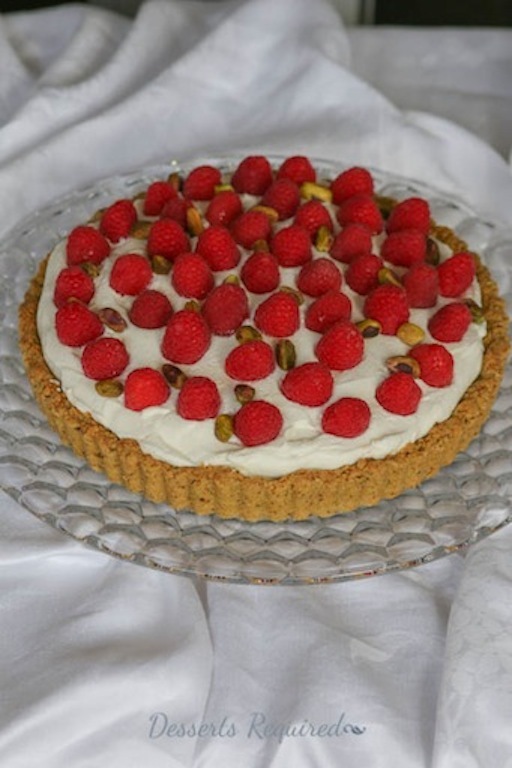 Raspberry Citrus Pistachio Tart has a pistachio crust that is topped with an orange mascarpone and whipped cream layer. Beautiful red raspberries are placed onto the cream and pistachios are sprinkled on top for the final touch. Seriously, a masterpiece of Florida’s finest ingredients. Will Raspberry Citrus Pistachio Tart be featured during the Taste of Rosen Shingle Creek Opening Ceremony at the Food and Wine Conference on July 18th? I do not know, although I certainly hope that it will. What I do know without a doubt is that you are going to have plenty of ‘ooohs’ and ‘aaahs’ when you serve Raspberry Citrus Pistachio Tart at your table. That’s what I call winning. Be sure to follow Rosen Shingle Creek on Twitter, Facebook, Pinterest, Instagram, and Google+ so you, too can stay up to date on the latest and greatest that the resort offers! Preheat the oven to 350°. Set aside a 9” tart pan. Place the flour, pistachios and sugar into the bowl of a food processor fitted with the metal blade. Process until the pistachios are broken into fine pieces. Add the butter and process until blended. Transfer the crust to the pan and press evenly up the sides of the tart pan and onto the bottom. Place on a piece of aluminum foil and bake at 350° for about 18 minutes, until it is set and no longer looks wet. Remove from the oven and cool completely. Brush the melted white chocolate onto the crust. Set aside. Place the cream, mascarpone, orange zest and sugar into a mixing bowl fitted with a balloon whisk. Beat, initially on low speed and then increasing to medium high speed, until stiff peaks form. Transfer the whipped cream to the tart. Use a small metal spatula to evenly spread the cream over the crust. Evenly space the raspberries over the top of the citrus whipped cream. Sprinkle with the pistachios. This is really just the kind of tart I love! I have made many variations on the berry-topped, mascarpone whipped cream filling combo, I think it is perfect. I so love your pistachio-orange-raspberry combo I have to try this! Thanks so much. The pistachio-orange-raspberry combo is really delish! I’m looking at this combination of pistachio, mascarpone, and raspberries and wondering why I never thought of that.This may just make an appearance on the dessert bar for the Fourth of July. Absolutely on my summer, “To do,” list. Looks fantastic!!!! Oh, wow! Every layer sounds magnificent!!! And such a showstopper!!! Good luck! Love how you came up with the ideas and adore the flavor combinations. Great job Betsy and good luck! Thank you. These flavors do work beautifully together. Thank you. If you make a grain-free version, please let me know how it is!! This looks so delicious. The presentation makes it perfect for wowing guests at a dinner party too!